Using this simply time-series analysis…is it not possible to pepper PNAS with reams of analyses that describe “very unlikely just due to natural variability” conditions because of what has occurred primarily since 1980? What if there was a spot on Earth that may have stayed flat (or even cooled) since 1980? Would these, using similar analysis, when published, mean anything? I don’t think it makes sense to talk about an individual event having x% chance of occurring with the bias or trend, and y% without. Probabilities can really only be about sets of data, not individual data points. It makes sense to say that we have, for example, 50% more warm records in the last two decades than the previous two decades, or that we can expect warm records to increase by 10% per decade on average, but not that any particular event has 80% chance of being due to global warming – that’s meaningless. It’s OK to make a general statement about the consequences of the warming trend, like “events of this magnitude are now 80% more likely to occur in any given decade”, but it’s not OK to say “this particular event was 80% likely to have been due to the warming trend”. The real world just doesn’t work that way. I hope this makes some kind of sense to everyone. Thank you for the code. I’m a SAS programmer, and at my age, the thought of learning a new language is unappealing, so I translated this to SAS (below). My point in this posting is to follow up on my comments at the end of the Moscow warming thread. You have made it clear that you are looking at warming from all causes. My issue is that this is being widely interpreted as showing the effect of global warming (loosely defined), while the actual observed warming in this region may have other significant components. My main concern was AMO, under the assumption that the AMO might account for a significant fraction of the recent temperature trend observed in Moscow. 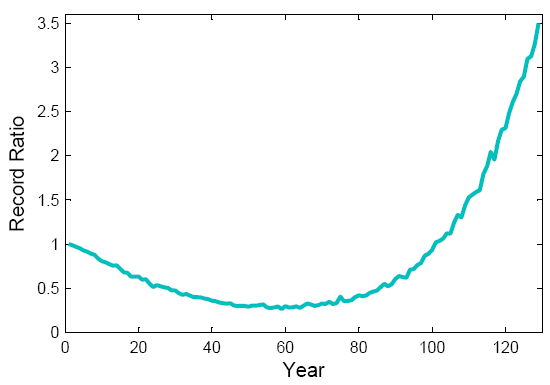 I wanted a simple sensitivity analysis: What would the results have looked like if we had merely experienced the temperature trend of the 1930s again. Obviously this is crude, yet I think it has some natural appeal for determining how different the present situation (reflecting global warming) is from the past. Obviously, the actual observed 1930s data is a poor proxy for the AMO signal, so I’ll also test for a peak that’s half-a-degree below the 1930’s peak. In short, I’ll compare the data as presented, a peak matched to the 1930s (trend ends at 0.5C below then 2009 value), and a further test case (trend ends at 1C below the 2009 value). The results are 81% (replicating your main result), 72% (replaying the 1930s peak) and 54% (for 0.5C below the 1930s peak). My conclusion is that any temperature trend for this geographic region that looked similar to the 1930s — here, plus or minus half a degree C — would generate a substantially increased likelihood of new high temperature records. In particular, if there is a strong cyclical component due to AMO (impossible to determine empirically, but useful at least as a straw man), then it is proper to attribute the increased odds to warming, but possibly not proper to attribute them to global warming. SAS code follows. Vastly wordier than Matlab, but this is not was SAS was designed to do. Oddly, something about the process of posting garbled the lines in the SAS code above. What’s posted is gibberish (e.g., there are unclosed parentheses, logic aside it would not run as written). I won’t bother to try to post the correct code unless somebody else wants to work with it. The results as stated are correct, the SAS code is garbled. I’m agitated that this group, for whom I have the greatest respect, have not mentioned, even in passing that the debate is over. It’s been over for a hundred years. 1. CO2 was discovered 150 years ago. 2. It’s properties -it inhibits passage of electro-magnetic-radiation in the ‘heat’ range- were discovered 100 years ago. 3. The buildup of CO2 in the atmosphere was discovered 50 years ago. There’s nothing to discuss! This interminable debate of the ‘hair on the flea on the dog’ may be considered PC but it certainly is not as important as reporters and some contributors make it out to be. An important question is this: How do you feed a million people whose homeland has been inundated? This massive aggregation of brain-power could absolutely be put to better use. That’s quite an assumption. I see no more evidence that AMO is responsible for warming than that Leprechauns are. I suggest you take that up with those who are making that interpretation. Thanks for an interesting article. Your paper isn’t one I’ve come across before, I’ll read it properly tomorrow on the bus – so apologies if any of the following is actually explained by the paper, on an initial perusal it doesn’t seem so. As far as the above article goes: The extreme rise in ratio at the end of the series in both figures 3 & 4 initially reminded me of research I’ll get onto below. However as I don’t think we can say with confidence what the trend would be in the real world I’m not sure about the utility of this in terms of whether or not we are seeing a strong increase of natural disasters in our climate. It seems to me that the primary cause of the massive increase in ratio at the end of the series is due to the decreasing probability of new records as the stationary series gets longer. Over at Tamino’s ‘Open Mind’ blog there was a discussion about extreme weather events using . I commented about some research from EMDAT about trends in European floods, “Three decades of floods in Europe : a preliminary analysis of EMDAT data.” PDF here. Figure 1 of the EMDAT report shows an exponetial rise in floods from 1973 to 2002. This is against a background in the EMDAT database of a rise in reported flood and storm disasters that is over and above the trends in reported non-hydrometeorological disasters, ref – note in particular the difference between wet and dry earth movements. This would at face value appear to suggest an increase in hydrometeorological disasters and the most plausible explanation for that would be the intensification of the hydrological cycle due to AGW. However figure 2 of the EMDAT report shows that a change in reporting sources from 1998 accounts for much of the recent rise in reported disasters. The question I’ve not been able to work out is whether the change in reporting wholly explains the recent increase in floods, or whether there is indeed an underlying increase in floods. If changes in technology (e.g. internet) and reporting ‘fashions’ wholly accounts for this increase then at some stage it should saturate. By that I mean that the press can only report what is happening, if they report an increasing percentage of events then at some stage they’ll near 100% coverage, at which point if the series is stationary the increasing trend will not sustain and will level out. I suspect that whilst reporting bias and increasing urbanisation (e.g. building on flood plains) accounts for some of the post 1980 increase, I also suspect there is an underlying element due to the intensified hydrological cycle. If anyone can clarify this, or point to research that does I’d be grateful. I agree that the debate as to the reality and ongoing nature of AGW is over. However the debate as to it’s progression in terms of impacts (the most important metric for humanity) is not over. Christopher, you shouldn’t overestimate the role of AMO. I don’t know if you have bought into the mistaken belief that the ‘S-shape’ of the 20th century temperature curve is largely caused by the AMO — it is not. The peak-to-peak of the AMO in global temperatures is no more than some 0.1C (e.g., Knight et al. 2005). Compare this to a total temperature increase over the 20th century (from Rahmstorf & Coumou) of 0.7C, with an interannual variability of +/-0.09C. It gets worse looking at Moscow: there, while both the total temperature increase and (perhaps) the impact of AMO are about double that of the global case, the interannual variability is a whopping +/-1.7C. Any AMO effect would find it hard to stand out against this background. About your code: Perhaps put it on a web site and give a link to it in a comment here. Icarus62, Your interpretation of probability is one possible interpretation (namely, the frequentist), but it is not one that is universally accepted. And what would you say about a probability in quantum mechanics, where the probability of a measurement is well defined in terms of the wave function? Generally, however, in my experience, even Frequentists have no trouble assigning probability to a single event. I looked at the EM-DAT data some time ago. There are obvious, and very strong, effects due to changes in both the likelihood of reporting and the way that effects (e.g. estimated number of fatalities) are estimated. These seem to be extreme for the older data, but likely continue even to more modern times. I concluded, as you suggest, that it’s very difficult to disentangle observational effects from physical changes. So I fear that those data, at least, aren’t sufficient to answer your questions. And that’s a real pity. If one is unwilling to re-examine one’s assumptions, analysis, and conclusions, learning and discovery stops. Regardless of what the preponderance of the evidence says, the debate is NOT over, because there is always more to learn, deeper understandings and insights to gain, and the occasional surprise. Have the confidence in your thinking to be willing to question it – always and forever. As you are solving for the observation in 2009/10 you probably should not use those values in the analysis. The value above the rolling median in this case, is the maximum temperature above the changing mid-range value or is the “extreme value”. 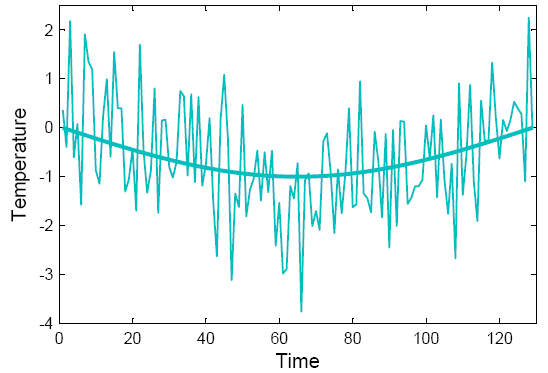 By removing the changing mid-range (normalizing the data as though it represented a stationary climate) and simply plotting the maximum values, it still describes a parabola. 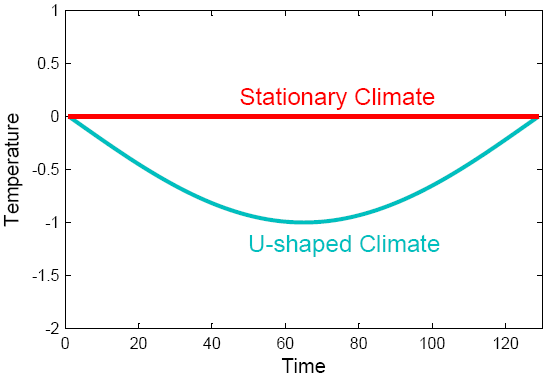 The tilted form of the resulting parabola, where the fixed point can be the median and the resulting tilt of the “fixed line”, describes the change from a stationary climate. Are we seeing a second effect also perhaps. Posulate that instead of just the average trending upwards, that the standard deviation is increasing as well. Then the effect would be even more pronounced. In fact if you had a flat average, but the standard deviation went up, you’d still get a lot of records. So do we have data on whether the standard deviation, which represents some sort of weather variability measure is changing? Stefan — I thought this quite a good and clar exercise. But I now, on physical grounds, wish to doubt the white noise assumption. Obviously one could rerun the exerise for 1/f^a noise, pink noise, for various values of a between 0 and 2. Rather than doing so I’ll simply ask if that changes much. Thomas – that’s not right. A larger standard deviation leads to less record-breaking. It’s one of the main findings of the Rahmstorf and Coumou paper (building on earlier work in this regard). That’s why the Moscow July temp series sees less record-breaking warm events, than the GISS global temp series. Moscow in July warms at 1.8°C over the 100 year period, but the year-to-year variability is 1.7°C. 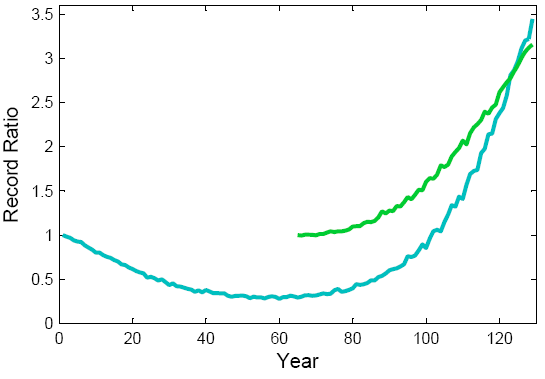 GISS on the other hand, has 0.7°C over 100 yrs, but an interannual variability of only 0.088°C. The same deal applies to the MSU satellite vs surface temperature datasets. The satellites have larger interannual variability than the ground-based network and therefore a smaller probability of record-breaking. This is explained in the paper, which is freely available here. I don’t think Thomas was referring to a larger standard deviation series having more records than a smaller one (as was addressed in Rahmstorf & Coumou), but to an increase in standard deviation within a single series leading to more records. Geno “more to learn, deeper understandings and insights to gain, and the occasional surprise” has no relevance to the central debate being over, any more than it does to evolution science, where exactly the same phrase could be used. Did anyone thought yet about applying memristive functions, to model nonlinearity behavior? You don’t. They die. The difficult part may be realizing what is possible and what is not possible. Do what you can and don’t try to do what you can’t. The action to take is to stop the Global Warming. You could also try to stop the growth of population. The point of continuing to tell people what has already been discovered is that the people have not become convinced enough to act on GW yet. The sooner we act, the more people will be saved. The later we act, the fewer people will be saved. Scientists cannot dictate policy. Justice is a human invention found nowhere in Nature. There will be no justice. Excessive altruism will lead you into more of what you don’t want. Climate change is not an isolated event, as many come to recognise there are cyclical changes, occasionally the phasing is such (with relevant delays) that is likely to produce a cumulative extreme. One of the rare occasions happened in the late 1690s-early 1700s. If the current decadal period is one, time will tell. Will circumstances render the math unnecessary? To Tamino,comment 7. I don’t have a model that decomposes the local temperature change into a global warming (broadly defined) and other. But neither does anybody here. So ignore my ham-handed exercise in trying to parse out the marginal effects of global warming. There’s still an issue here. Nobody can take serious issue with the arithmetic. The observed warming at that location creates substantially higher odds of a new record. Some of the statistically-oriented comments above have noted, maybe that could have been done better, but I think that’s unlikely to be empirically important. What’s a little sketchy is that the writeup is of two minds about causality. Formally, it clearly states that it’s not attribution, and ignores the outlier 2010 year when calculating trend. Informally, it’s a tease. Look at the last sentence in “It ain’t attribution” paragraph. I paraphrase: It ain’t attribution (but we all know it’s global warming). Alternatively (but what else could it be). Or compare the temperature trend graph in the prior posting to the data actually used. The graph boosts the 2009 value about 1C relative to the data. That the graph and data differed was noted in the text, yet I’ve never before seen that sort of visual exaggeration used on Realclimate. So here’s my technical question. Why? Why do you have to tease about the causality here, rather than test it in some formal way? Was it just a time constraint, or is there some fundamental barrier to doing more than just hint as to cause? I can think of any number of naive things to do, other than comparing the current trend to prior peak as I did above. So here’s one. Why not take the median temperature prediction from an ensemble of GCMs for this area, with and without GHG forcing, monte carlo with the actual observed distribution of residuals, and attribute the marginal increase in likelihood under the GHG scenario to the impact of GHGs on temperature records. Is that too much like the Dole analysis? Are the models insufficiently fine-grained to allow this? Do they do such a poor job at local temperature prediction? I’m not suggesting the burden of developing the distribution of temperatures via iterated runs of the ensembles, just taking (what I hope would be) canned results and hybridizing them with the current method to parse out to which GHG-driven warming has raised the odds of a new high temperature. To me, as this stands, the writeup is unsatisfying. You have unassailable arithmetic that, by itself, strictly interpreted, has little policy content. Then you have not-quite-attribution material wrapped around that – clearly distinguished from the formal analysis. I’m just wondering if there was some fundamental barrier to combining the two, or whether there is no formal (yet easily implemented) way to put the policy context on some firmer ground. Could you expand on the North Atlantic precursor in your graph. Is it related to the NAO, AMO, or some other factor? I have a question on language and testing and language. If say we have a loaded dice that will roll a 6, 5 out of 6 times, then it seems if a 6 were to be rolled we can say the 6 had the probability of (5-1)/5 = 80% being a result of the loading. Is there a better term than do to loading the dice? If we role a 2 it was less likely on the loaded dice, and I’m hopeing for some better language to explain this to people that don’t understand statistics. On the substance of the paper there is modeling of the variability of the temperatures and trend line. It seems fairly straight forward to test this model on a fairly large number of data points. The last decade was fairly hot. Has this been tested on a number of regions with historical data and verified to be a good predictive model of records? The NAO, and some years later AMO, are related to North Atlantic Precursor. this is a relationship that current science may have a bit of a problem verifying, data is there, but mechanism is not so clear cut as the graph may suggest. Getting a record ratio curve like that just because you made the climate U-shaped is astounding. It is so counter-intuitive that I predict a lot of people won’t believe it. What happens if you invert the U? Same as the half U? Thanks, an excellent post that knocked some rust off of my stats and probability, and answered some questions in my mind about this kind of study. I’ve been thinking for a while that it isn’t any single unusual event that will create the most serious kinds of problems, it is the risk that more than one event happens in the same year. As unusual events become less unusual, that risk goes up. It was convenient that the US farmers had a good year at the same time the Russian farmers had a bad one, and still, one could conjecture that the Arab Spring was sparked by high food prices resulting from Russia not exporting any wheat to that region that year. Probably that fire was already prepared, but it might have needed a spark. Which leads me to comments #5 and #20. If the 100 million are isolated by geography, they die, but if they are not, then they inundate whatever nearby areas there are. Then, depending on political and economic conditions of those regions, they either die, are fed, or trigger social upheaval that could potentially result in more deaths than if they had been isolated. I believe all scenarios (with smaller numbers) have played out in history, but it is damnably hard to predict because so much depends on the decisions of those in power at the time. Not that those in power can be blamed always; there are no-win scenarios. Unless Moscow was chosen a priori the analysis is highly suspect. Run a Monte Carlo simulation of 100 cities and a posteriori pick the city with the largest record and I’m sure you could get a similar result just due to randomness. [Response: I think you may not quite understand our analysis. All the Monte Carlo simulations tell us is that with the given (nonlinear) climate trend, the chances of hitting a new record are five times larger than without the climate trend. This conclusion would remain true even if there had not been a record in Moscow in the last decade. Our analysis finds that the chances of a record in the last decade were 41%. It might as well have not occurred. But it is five times as large as the 8% that you would expect in an unchanging climate. Die-hards (pun intented) still use die as the singular noun for that little cube with spots on it, and this is still considered correct as listed in all the main dictionaries I believe. However, the Oxford dictionaries (online at least), and possibly others, now list dice as “a small cube with each side having a different number of spots on it”; i.e. use in the singular is approved usage. And under die usage they note “In modern standard English, the singular die (rather than dice) is uncommon. Dice is used for both the singular and the plural”. Oxford dictionaries have made this change to common usage at some time since 1994 (which is the date of my edition of the SOED in which “die” is the only singular version given). Time for me to update my SOED! So, both versions are now considered correct, and so confusion and arguments will no doubt reign. Stefan, some of us still use the singular forms “die”, “datum”, and “phenomenon”, but we appear to be in danget of extinction. “Die” is correct, though I think this is something people often get wrong. Mathematics says that probability of high temperatures with a convex upward curve is the same as the probabilities of record LOWS, with a concave up curve. If you plotted high and low probabilities on the same graph, it (probably &;>) would look like this. Yes: die is old-school singular. But then I also remember when “inflammable” meant “burns easily”, non-flammable meant it wouldn’t, and you couldn’t find “flammable” in the dictionary. It is the nature of knowledge that it is never completely certain, because the contents of our mind is limited by our human abilities to perceive, analyze, and conceive. To make statements like “the debate is over” with reference to scientific discussions is to betray a fundamental lack of understanding regarding epistemology. David Horton is simply demonstrating this lack of understanding, as did 5blue7053 before him. To refuse to debate is to tread into the realm of dogma, not science. To make statements like “the debate is not over” with reference to some scientific topics — say, the health risk of smoking for example — is not an exercise in epistomological purity. It’s a despicable, and rather pathetic, excuse to deny reality, usually for the most loathesome of motives. It’s also recorded history. Concerning global warming, we are watching history repeat itself. Please spare us your haughty appeal to philosophical uncertainty. Some aren’t. This post, for instance, is related to a current debate among reasonable people over whether a particular heat wave could have been anticipated based on past trends. That question, in turn, is related to the no less debated question how particular events can be ascribed to man-made global warming. I hereby declare the debate over the debate being over, over. To make statements like “Regardless of what the preponderance of the evidence says, the debate is NOT over” (your words in comment #12) without stating specifically what particular “debate” or what particular “scientific discussion” you are talking about, is vacuous. Yes “die” is the singular. It is forgotten because dice nearly occur in pairs. Other singulars are “addendum”, “agendum” and “stadium”. The word “cattle” is notable for not having a singular. We have words for a single male or female of the species but if you see one some way off and can’t tell the gender we don’t have a word for it. This is the information humanity needs. Has it been published? Are you working on it? Geno Canto del Halcon, look at it this way: scientists are constantly striving for a deeper understanding of gravity. However, new discoveries in this area are not going to make satellites fall out of the sky, nor will Newtonian calculations be any less successful when calculating how to launch a rocket to Mars. Likewise new discoveries in atmospheric physics will not make all the usual processes of energy exchange stop happening. Climate science the working out of standard physics and chemistry on a planetary scale. A planet as a whole can gain or lose energy in very few ways. On a planet like ours a big portion of the daily energy loss (to compensate for the energy gain from our star) takes the form of longwave infrared radiation. Certain gases intercept and re-radiate this radiation through the atmosphere. The energy is finally lost to space from the cold thin upper atmosphere. The whole process is mediate by certain gases and is called the greenhouse effect. This is not going to change, just as satellites are not going to fall out of the sky on account of new discoveries. But scientists hardly consider all questions answered. Why do you suppose they keep on doing research? In the area of climate change we have not only an interesting application of physics, we also have a very large slowly developing human problem. There is something obvious we can do to keep the problem from getting too large and harmful. We can change the way we get usable energy. The reason this change is delayed is so that the current top energy companies can continue to accumulate large sums of money. Please don’t help them. Pete Dunkelberg @43 — … precipitation is still more concentrated in fewer stronger events. I’ve certaqinly seen this expressed several times but have not read a definitive study. Yes “die” is the singular. It is forgotten because dice nearly occur in pairs. Other singulars are “addendum”, “agendum” and “stadium”. And as has been pointed out above, “dice” as the singular is accepted by linguistic authorities (such as the Oxford Dictionary). If people think that English must be a dead language, then surely they reject words like “internet”, and all that follows? I look forward to your bibliography of recent papers on the luminiferous aether. #47–Not even trying to resist the OTness of this linguistic stuff. . .
Well, it presumably went up “in flame” too–and I think “inflammable” was originally meant to convey “capable of becoming inflamed.” Which now sounds exclusively medical–but I think it was not always thus. One question; Does the above data simulation for heat records hold true when looking only at the minimum values (regarding winter records in the the same manner). From a thought experiment point of view, variation will give similar results as directional change. Is this correct as long as the variation is similar to your curve and is bigger than the directional change. Jumping back to the real world, and the paper, it seems that the trend line includes both local climate change and low frequency climate variation. There definitely appears to be some climate variation in the 130 year trend line. Would it not be more proper to say that the dice is then loaded with both local climate change and climate variation, and the comparison model had no cyclical climate variations? This would make the event more likely due to climate change and variation, which seems easy to grasp. The interesting thing is not the direction but the probabilities. Following up on the language part, say the January low in oklahoma this year had similar loaded dice against it. Would the probability be (1-5)/1 = -400% that the low was due to climate change? Or would it be better to say since it is a negative number climate change is unlikely to have had anything to do with causation of this record low?